Why Are Frogs So Many Different Colors? Animals > Frogs > Why are Frogs So Many Colors? Well, this is a good question to think about. Are all of the people in the world the same color? Are all of the dogs and cats in the world all one color? Nope! With that being said, why should we assume that frogs are all going to be the same color? There are 3000 different types of species in the frog and toad family and all of them are just a little different and special in their own way. There can be red, green, blue, purple, yellow and even metallic-looking frogs and they all have very distinct markings and are definitely those colors for a reason. There are several reasons for all the different colors. 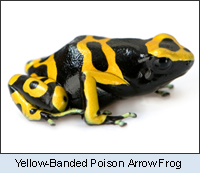 A bright color could tell other animals if the frog is poisonous or not. Some frogs that are not poisonous have become bright colors too, called ‘mimicry’, in hopes that predators will mistake them for a poisonous one. Many frogs can change their colors according to their surroundings (camouflage). 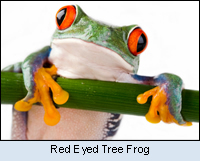 Some frogs, like the Ornate Tree Frog, even come in different colors and shapes within the same species. A White’s tree frog can even change his own color depending on where he is sitting. Some frogs have bright colors just underneath, like the Fire-Bellied toad – so if a predator bothers it, it will flash the bright color at it and hopefully scare it away. 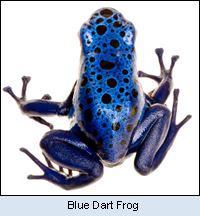 So as you can see, there is not one answer to why we see so many different colors of the frog. There are many different reasons, and most of them involve clever ways for the frog not to be eaten.